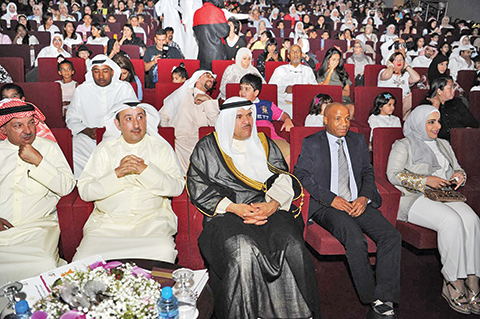 KUWAIT: Minister of Information and Minister of State for Youth Affairs Sheikh Salman Al-Humoud Al-Sabah inaugurated Sunday the 18th edition of the children and youngsters cultural festival. This annual event is meant to foster cultural knowledge and hone cultural skills among children and teens, Sheikh Salman, who also heads the National Council of Culture, Arts and Letters (NCCAL), told reporters on the sideline of the opening ceremony. It is of significant importance to inculcate the positive culture and the state has to start early these cultural activities to enrich the knowledge of youngsters and harness their talents as well as provide them with useful entertainment and excitement activities. He noted that NCCAL’s efforts to develop children culture is a key factor for the success of the national strategy to boost the role of culture in serving the homeland and promoting its national identity. The 33-day event comprises a variety for cultural and artistic activities. Meanwhile, Acting Secretary General of the NCCAL Mohammad Al-Asousi stated that the festival is one of main events on Kuwait’s cultural agenda. This year’s edition is special as it coincides with the state celebrations of choosing Kuwait as a capital for Islamic Culture for 2016, he said. He emphasized the role of culture in promoting tolerance and dialogue and countering extremism and exclusion of others. The festival was commenced with Cinderella performance by a Russian troupe. The performance is an adaptation of the centuries-old folk tale of a young woman, named Cinderalla, rise from oppression and ultimate discovery of true love.